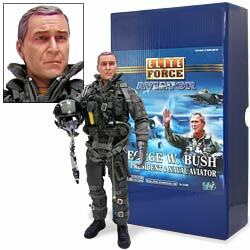 BBI proudly introduces the latest issue in its Elite Force series of authentic military 12- inch figures, President George W. Bush in naval aviator flight suit. Exacting in detail and fully equipped with authentic gear, this limited-edition action figure is a meticulous 1:6 scale recreation of the Commander-in-Chief's appearance during his historic Aircraft Carrier landing. On May 1, 2003, President Bush landed on the USS Abraham Lincoln (CVN-72) in the Pacific Ocean. While at the controls of an S-3B Viking aircraft from the Blue Sea Wolves of Sea Control Squadron Three Five (VS-35), designated Navy 1, he overflew the carrier before handing it over to the pilot for landing. Attired in full naval aviator flight equipment, the President then took the salute on the deck of the carrier. This fully poseable figure features a realistic head sculpt, fully detailed cloth flight suit, helmet with oxygen mask, survival vest, g-pants, parachute harness and much more. The realism and exacting attention to detail demanded by today's 12-inch action figure enthusiast are met and exceeded with this action figure. This incredibly detailed figure is a fitting addition to the collection of those interested in U.S. history, military memorabilia and toy action figures. Actual figure may vary slightly from item shown. Note: some plastic accessory trays inside the commemorative display box may have extra spaces.